At Hidden Creek, we welcome riders with varying competition goals. Many of our riders choose not to compete, or to show just for fun. However, we do offer many opportunities to our more competitive-minded students and boarders. Scroll through our rider links below to meet some of our students and read some of their accomplishments. PLEASE NOTE THAT OUR RIDER BIOS AND PAGES ARE CURRENTLY UNDER CONSTRUCTION! THEY WILL BE UPDATED SHORTLY! Alex is a working student at Hidden Creek and an acclaimed young rider. She is an ESDCTA Bronze Medalist, rode on our ESDCTA Champion quadrille team for two years, and has represented ESDCTA at the 2013 Region One Youth Team Competition as a member of the Reserve Champion team. 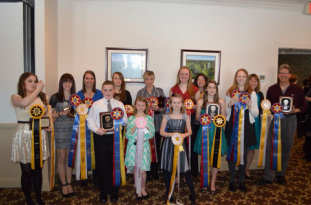 Also in 2013, Alex won Reserve Champion in the Training Level Junior division at the NPASS Championships and Reserve Champion in the Training Level Junior division for ESDCTA Year-End Awards. She is also an avid Ride 4 Hope participant and won the team Gold Medal in 2013. This year, Alex is riding a Training Level Musical Freestyle and a Training Level Pas de Deux. She will also be doing some combined training, and is riding on on a Ride 4 Hope quadrille team. Laurel is a working student at Hidden Creek and has been competing with us for many years. She is an ESDCTA Bronze Medalist, rode on our ESDCTA Champion competition quadrille team for two years, and has represented ESDCTA at the 2013 Region One Youth Team Competition as a member of the Reserve Champion team. Also in 2013, Laurel won Third Place in the First Level Junior division for ESDCTA Year-End Awards and a team Gold Medal at the Ride 4 Hope Musical Challenge. In past years, she has won Champion and Reserve Champion at the NPASS Championships. This year, Laurel is competing at Training Level on Nemo. She will also be riding a freestyle at Ride 4 Hope. Laurel will be leaving us at the end of the summer to attend Rochester Institute of Technology as a Computer Science major. Ashley is a working student at Hidden Creek and an ESDCTA Bronze Medalist. She has represented ESDCTA at the Region One Youth Team Competition for three years, and she has ridden on a Ride 4 Hope quadrille team since the event's inception in 2009. In 2013, Ashley won Reserve Champion in the Training Level Musical Freestyle division and Reserve Champion in the Starter Combined Training division for ESDCTA Year-End Awards. She additionally won Reserve Champion in the Musical Freestyle division at the NPASS Championships, where she was also Third Place in the Combined Training B division. 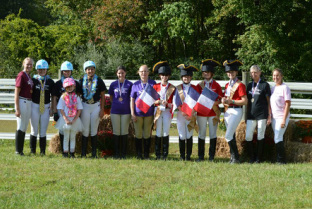 At the 2013 Ride 4 Hope Musical Challenge, Ashley was on the Silver Medal quadrille team and also won a Silver Medal in the freestyle category. This year, Ashley will continue to do some combined training. She is also riding a Pas de Deux with Jessie. Ashley will be leaving us at the end of the summer to attend Misericordia University as an Occupational Therapy major. Holly is a working student at Hidden Creek and an ESDCTA Bronze Medalist. She has been on the ESDCTA Champion competition quadrille team for two years, and has been an avid participant of Ride 4 Hope for two years, winning the team Gold Medal in 2013. Also in 2013, Holly won Reserve Champion in the USDF Rider Test division at the NPASS Championships. This year, Holly will be riding at First Level and will also be competing on a Training Level Pas de Deux team with Alexandra. Click here for a complete list of Holly's recent riding accomplishments. Despite her young age, Riley is an honorary working student at Hidden Creek and an accomplished rider. Last year, Riley made her debut at ESDCTA recognized shows. She won Champion in the Starter Walk/Trot division at the NPASSS Championships and Fourth Place in the same division for ESDCTA Year-End Awards. This year, Riley has moved up to Starter Walk/Trot/Canter. She is also riding on a quadrille team at this year's Ride 4 Hope Musical Challenge. Click Here for a complete list of Riley's recent riding accomplishments. Abby Knudsen is a working student at Hidden Creek. In 2013, she was honored with the ESDCTA Good Sportsmanship Award. On top of that, she is an acclaimed young rider. She has won the NPASS Championships in past years and has been an active quadrille team rider in the Ride 4 Hope Musical Challenge for two years, winning a team Silver Medal in 2013. This year, Abby will be doing Training Level with hopes of earning her ESDCTA Bronze Medal. Click Here for a complete list of Abby's recent riding accomplishments. Christine owns Duncan, one of our popular lesson horses, and accomplished great success during her first year as a competitive rider. In 2013, she won Champion in the Starter Walk/Trot/Canter Adult Amateur division for ESDCTA Year-End Awards. She was also Reserve Champion in the Starter Walk/Trot/Canter division at the NPASS Championships. Also in 2013, she debuted a musical freestyle and won Fourth Place at the Ride 4 Hope Musical Challenge. This year, Christine will be riding her freestyle, competing at Training Level, and riding on a Ride 4 Hope quadrille team. Click Here for a complete list of Christine's recent riding accomplishments. Mike made his competition debut in 2013 with great success. His goal was to earn an ESDCTA Year-End Award, and he did - he won Champion in the Starter Walk/Trot Junior division! This year, Mike has moved up to Starter Walk/Trot/Canter. He is also riding on a Ride 4 Hope quadrille team. Click Here for a complete List of Michael's riding accomplishments. Allie became the proud owner of a Quarter Horse mare named Orion's Midnight Star ("Nora") at the end of 2012. After successfully showing Nemo the year before, and winning Champion at the NPASS Championships, Allie began competing Nora in 2013. The pair won a Third Place ESDCTA Year-End Award in the Starter Walk/Trot Junior Division. Allie also made her quadrille debut last year at Ride 4 Hope, as she rode on the Silver Medal team. This year, Allie is moving up to Starter Walk/Trot/Canter and will be riding on a quadrille team again. Click here for a complete list of Allie's recent riding accomplishments. Rachel made her dressage debut in 2013, winning a Third Place ESDCTA Year-End Award in the Starter Walk/Trot/Canter Adult Amateur Division. She was also a member of the Bronze Medal pas de deux team at the 2013 Ride 4 Hope Musical Challenge. This year, Rachel will be moving up to Training Level. She will also be riding on a quadrille team. Click Here for a complete list of Rachel's recent riding accomplishments. Melodie is a Training Level dressage rider just a score away from her ESDCTA Bronze Medal. In 2013, she earned an Achievement Award at Training Level through ESDCTA Year-End Awards. She was also on the Bronze Medal pas de deux team at the Ride 4 Hope Musical Challenge, which she has participated in since its inception in 2009. This year, Melodie will be riding on a quadrille team again. Click here for a list of Melodie's recent riding accomplishments. Daniella has had much success at the Starter levels of dressage. She won Reserve Champion in the Starter Walk/Trot/Canter Adult Amateur division for ESDCTA Year-End Awards in both 2013 and 2012. In 2013, she was also Third Place in the same division at the NPASS Championships. This year, she will be moving up to Training Level. Click Here for a complete list of Daniella's recent riding accomplishments. Emma is a young rider at Hidden Creek. She made her showing debut in 2013, and won Champion in the Combined Training A division at the NPASS Championships. This year, she plans to show Starter Walk/Trot dressage. Click Here for a complete list of Emma's recent riding accomplishments. Naomi is an invaluable working student at Hidden Creek and an up-and-coming young equestrian. Despite being only 14-years-old, Naomi oversees many of the daily operations of our lesson program and horse care. In 2013, she won the HCEC Dark Keioki Award for Sportsmanship. She will be making her competition debut this year at Starter Walk/Trot/Canter, finally stepping out of her behind-the-scenes role into the spotlight! Irina will be making her competition debut in 2014 at both Starter Walk/Trot (on Mac) and Baby Green Combined Training (on Nemo). She has already become an active participant in the ESDCTA Youth Program, riding very successfully in the 2014 Youth Fix-A-Test clinic at Hidden Creek.